This game is definitely one of the better racing games out there. Although it doesn't look it at first glance, this game is surprisingly challenging. I have also played Mario Kart, and this game is, I'd say 2-3 times harder! It's a nice challenge, but not overly difficult either. The courses are all fun and lively. Each one is quite unique. 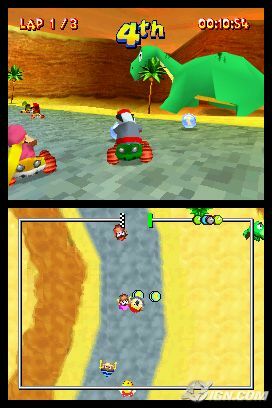 And what sets Diddy Kong racing apart from all of the other racing games would be the fact that not all of the racing is done with a car but you have the ability to use a plane and hovercraft as well, varying the game up a lot. A very good game, especially for kids. 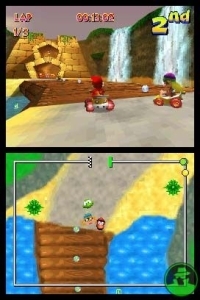 Diddy Kong Racing is actually a re-make of the N64 one. This version has new features and other things that seem amazing, but i personally prefer the orginal one, i wasn't really impressed with this edition, I don't know why. I still advise to try this one out, and you may or may not like it, depending on if you played the original or not. 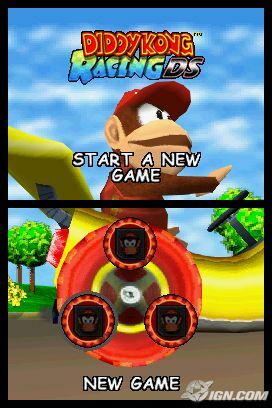 It's just like the original DKR... except the music is worse, the boss races are gone & replaced with a boring banana-touching minigame, no more bananas, Adventure 2 is shown on the main menu the whole time, you start with a relatively hard challenge before you can do anything else, it looks worse (in my opinion)... 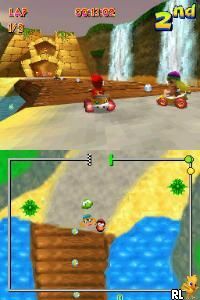 The only redeeming things are getting to slightly change your kart's stats and making your own (incredibly simple) tracks. By incredibly simple, I mean you can't even control elevation or have a part of the course go over/under another part. Now you can add videos, screenshots, or other images (cover scans, disc scans, etc.) for Diddy Kong Racing DS (U)(EvlChiken) to Emuparadise. Do it now! If you haven't noticed yet, we have a retro game of the day feature (top-right of the screen) wherein we feature a new retro title every single day! Now, you can vote for your favorite games and allow them to have their moment of glory. 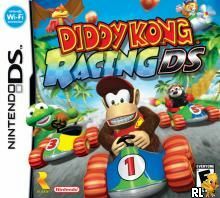 Click on the button below to nominate Diddy Kong Racing DS (U)(EvlChiken) for Retro Game of the Day.